Comfi Dreams Love Birds 2 piece nursery bedding set has been beautifully styled to be pretty in pink with butterflies, Love hearts and love birds. The reversible design allows you to freshen your nursery style when you please. The quilt cover is made from 100% cotton and detailed with fine stitching to enhance the style and look. 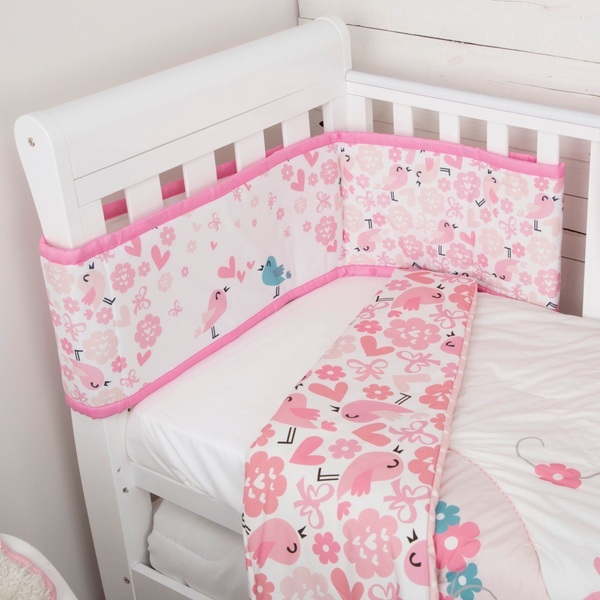 With a co-ordinated bumper bar uniquely made with breathable air flow fabric knitted together the open pores to allow greater airflow around the cot, the bumper bar is soft and gentle keeping your little ones arms and legs safely cossetted inside during sleep time.